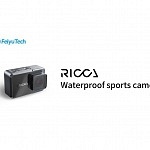 I got this camera because it was the first low budget action camera to offer 4K at a reasonable framerate (24fps), even tough it is interpolated. 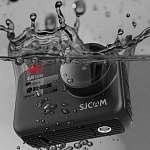 It was also the first action camera announced to offer built in image stabilization (the Git2 and SJ5000X followed a few weeks later). Also the powerful battery (1600 mAh) got my attention. 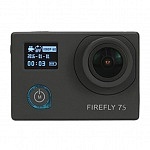 Later on a Firefly 7S was offered, which holds a 2″ live view LCD screen (Firefly 6S doesn’t have a live view screen), there are also some other differences, which I will show you later. The camera features a native 12,4 MP Sony IMX078 sensor. Same sensor is used in the new SJ5000X Elite camera by SJCAM. 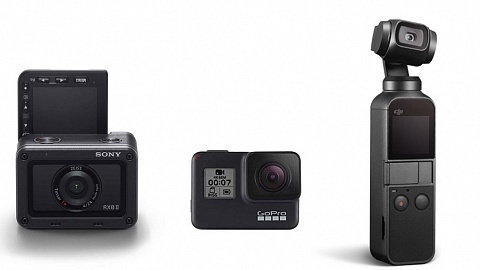 The GoPro Hero 4 also features a 12MP Sony sensor, but a different model (IMX117). Xiaomi Yi and Git2 hold a 16 MP Sony IMX206 sensor, the SJ5000+ a 16 MP Panasonic sensor. The Sony IMX078 sensor used in this camera has a sensitivity of 1437 digits and could shoot 4000 x 3000 pixels 4k at 42fps. This sensor is also used in the Pentax Q camera. Even tough it could shoot 4K with 42fps the Novatek 96660 chip is not capable of that. The Sony IMX206 sensor (used in the Xiaomi Yi and most likely will be in Git2) has a sensitivity of 1096digits and can only shoot 4k at 12fps. So at least for video application the IMX078 is better due to better low light sensitivity and higher fps in 4k video compared to IMX206. The camera holds a Novatek 96660 chip, same as the SJ4000+ & SJ5000X. 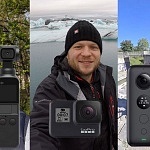 Cameras such as Xiaomi Yi, SJ5000+ and GoPro use an Ambarella Chip. 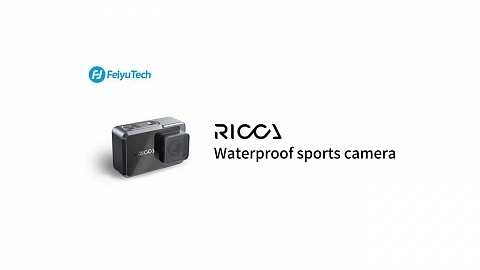 So it is the first budget action camera offering 4K in a reasonable framerate, even tough it’s interpolated. Data rate is 25 MB/s in 1080p with 60fps. The camera offers a small data display at the front, similar to GoPro cameras. The battery has the same size as the GoPro Hero 3 batteries (they have 1050 mAh). I tried the battery with the Firefly and it worked, but I can’t guarantee that it works nor harms the camera – if you do it, it’s on your own risk! There is an offer for a special Firefly 6S replacement battery. Be careful as Firefly 6S and Firefly 7S don’t share the same battery. Firefly 7S uses this type of battery. 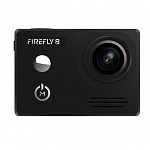 The camera offers wifi for remote via App (Firefly App for iOS and Android available), a miniUSB port and a microHDMI port for HD video output. A/V output via USB is available (and a cable is included); Mic in via USB is not supported. 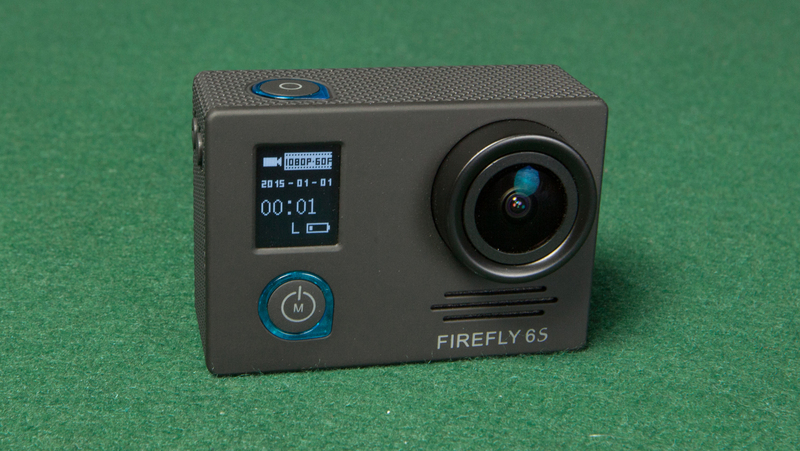 The Firefly 6S has the same size as the GoPro Hero and fits into the GoPro Hero underwater case. The power and record button have the same position and will work, although the menu buttons on the side can’t be accessed. Gyro image stabilization – the camera will stabilize your video to avoid shaky videos! 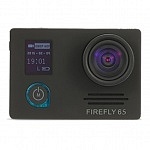 The Firefly 7S was released later and holds a 2″ live view LCD screen. Be aware, that’s not the only difference. 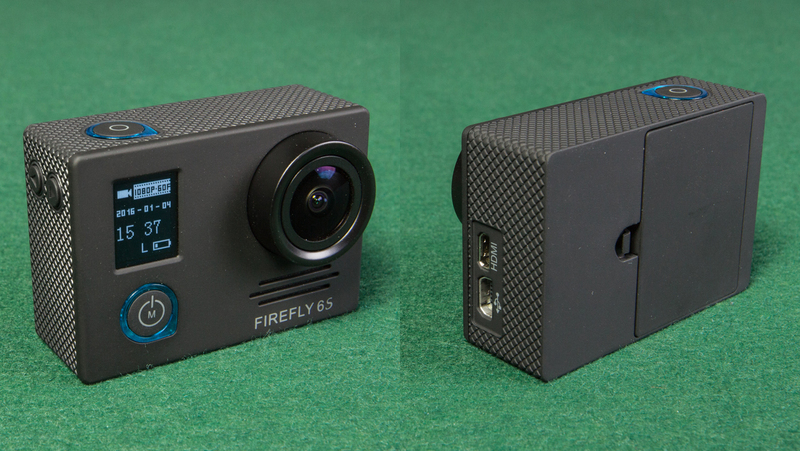 Whereas Firefly 6S holds GoPro Hero3 size batteries, Firefly 7S holds different sized batteries, similar to the new round EKEN batteries. 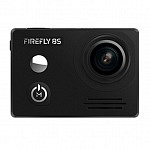 Firefly 6S is equipped with a mini USB port, whereas Firefly 7S holds a micro USB port. Nevertheless both don’t offer mic-in. 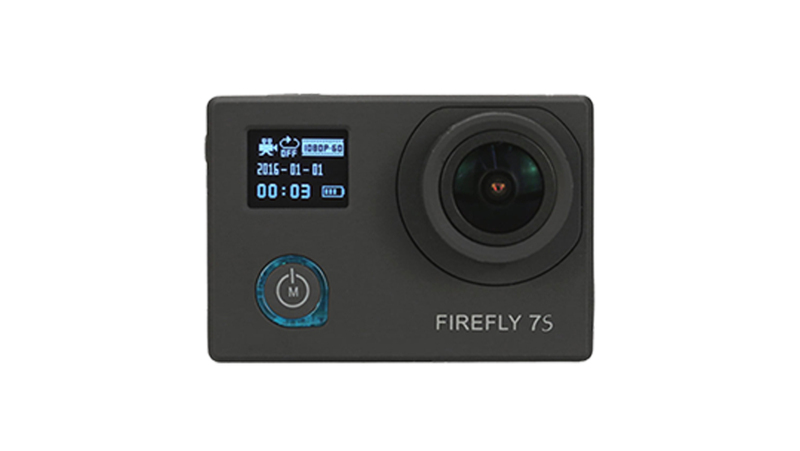 Firefly 7S is available in 2 versions – with 170° FOV lens and with 90° lens, which has a narrower FOV (field of view). Therefore it doesn’t have a fisheye effect and less distortion. FRONT: Power/Mode button where an LED light around the button is indicating record. Similar to the GoPro there is an and an OLED Display where you can check and change settings of the camera. The display shows mode (photo/video) as well as resolution selected, date (in video mode only), a counter while recording in video mode or estimated photos left on card in photo mode, WDR (wide dynamic range) status, field of view level and battery status. TOP: Record/OK button – where you start recording or confirm settings made in the menu. Same as with the power button, an LED around it is indication video recording or flashing when a photo is taken. BACK: similar to the GoPro Hero 3, there’s the door for the battery – as mentioned above same size as GoPro Hero 3. Besides the items shown on the photo, my camera also came with an USB – miniUSB cable, an USB A/V out cable and a rubber lens cap. This basic mounts are a great start and give you many options. 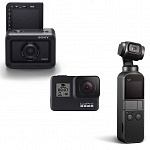 As mentioned above the camera has the same size as a GoPro, so you can use many accessories available for GoPros. 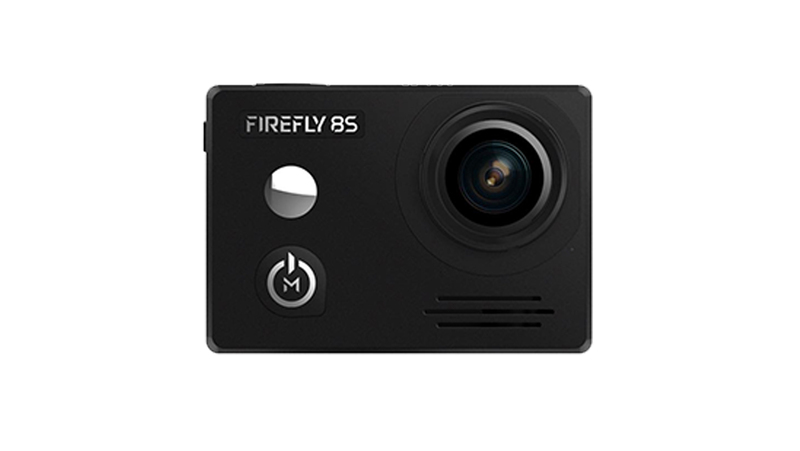 You just have to consider that the Firefly 6S has 2 navigation buttons on the left side whereas the GoPro has one wifi button. 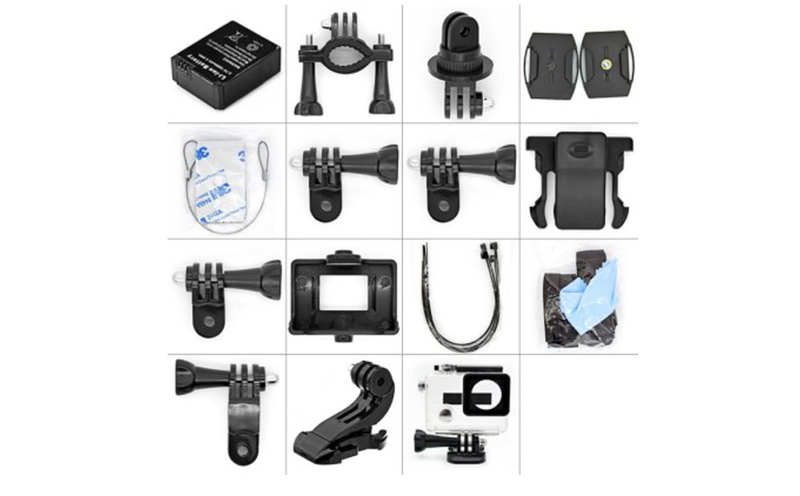 The “GoPro” mount on the bottom of the underwater case is of course compatible with all action camera accessories featuring this mount. You can find an overview of available accessories here. 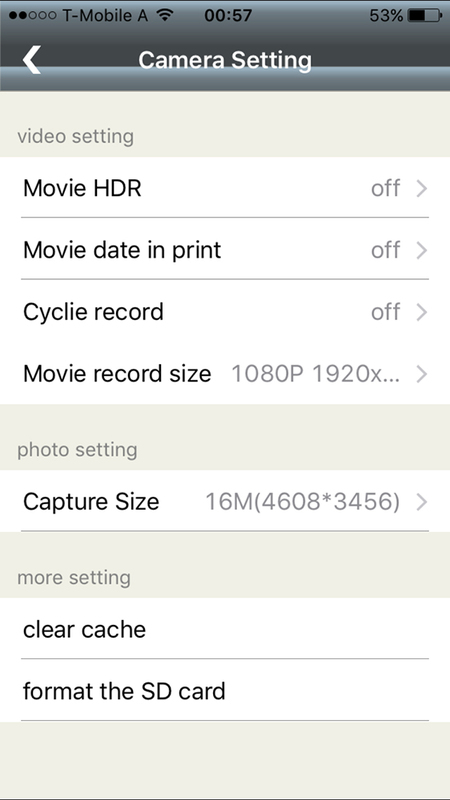 You have to options to change settings on your camera, either via menu/display on the camera or via app, but be aware that the app doesn’t offer all options, more on the later. Let’s take a look at the camera’s menu first. With the Power/Mode Button on the front of the camera you can turn it on an switch between photo and video mode which is indicated on the display. To enter the camera’s menu you have to press the navigation button on the side of the camera where you can browse the menu. You can confirm settings with the record button and leave the menu by pressing the mode button. I personally like the navigation a lot an prefer it over the GoPro navigation (where you have to move around using mode and wifi button). 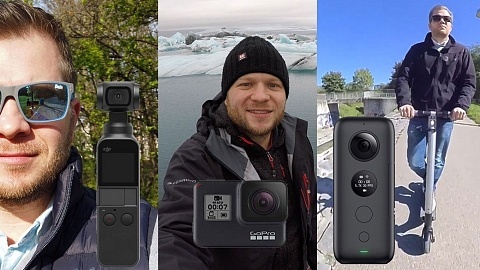 It is pretty simple as the buttons are clearly assigned, only disadvantage compared to the GoPro is that there is no designated wifi button. Even tough there is an “TV-Option” for PAL and NTSC there is no option to with to 25 / 50 fps. You have following interval options: 0.5 / 1 / 3 / 5 / 10 seconds. A video of your time-lapse is created automatically, photo time-lapse (where several photos are saved) is also available. The camera will automatically start recording once it is connected to a power source via USB. 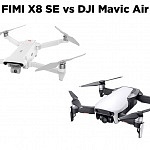 Also interesting when operating with a drone or gimbal. 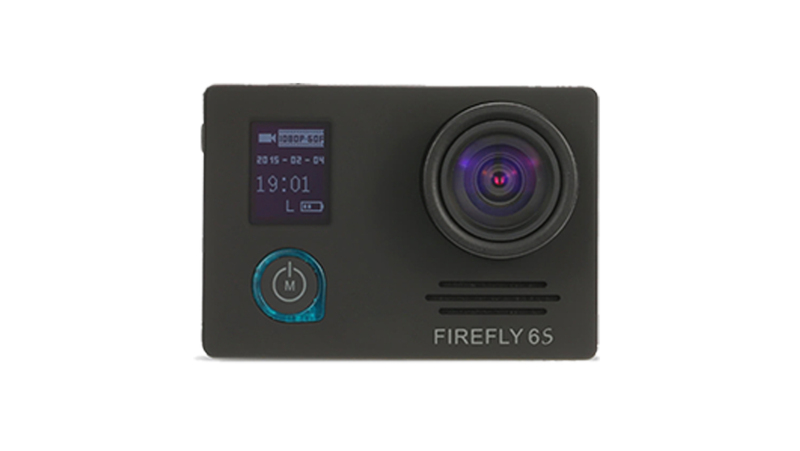 The manufacturer suggests selecting this option when the Firefly 6S is used in cloudy and dark environment. When used in bright sunlight WDR can cause overexposure. 16 MP / 8 MP / 5 MP are available. I usually keep the highest setting. It’s a bit strange the the max. is 16MP when the sensor is just 12MP. The camera will take 11 photos within a second, the rate can’t be changed. You can take photos with an interval of 3 / 5 / 10 or 30 seconds and create an time-lapse out of them. 0,5sec is not available in contrast to video time-lapse. 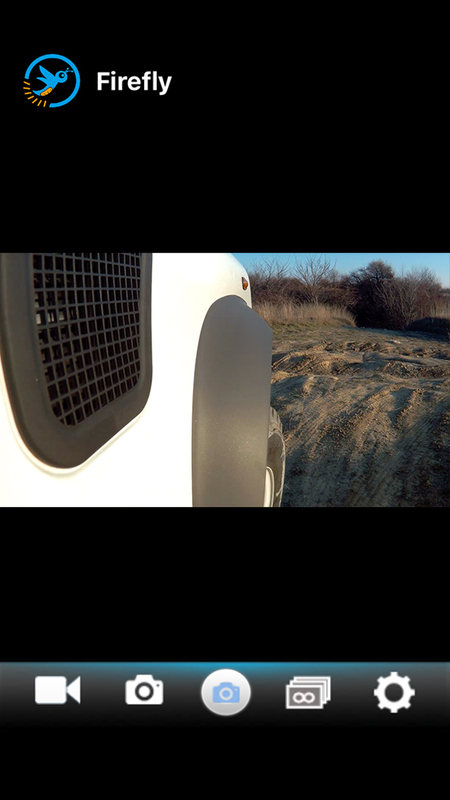 Great that you can select ISO, not all action cameras offer this option. AUTO / 100 / 400 / 1600 can be selected. In the manual there is a notice that you should hold your camera steady when taking photos. This would more likely refer to shutter than ISO. 3 options are available: High, Medium and Low where Low is suggested to be selected at night. This is to reduce noise. Medium is the suggested standard setting for video and photo. You can select between standard and vivid. If you want to edit your photos and videos in post-production standard is recommended. You can select PAL or NTSC, which is rather strange as you can’t select 25fps which would be PAL. You can turn on wifi only in the menu, there is no dedicated button compared to many other action cameras. 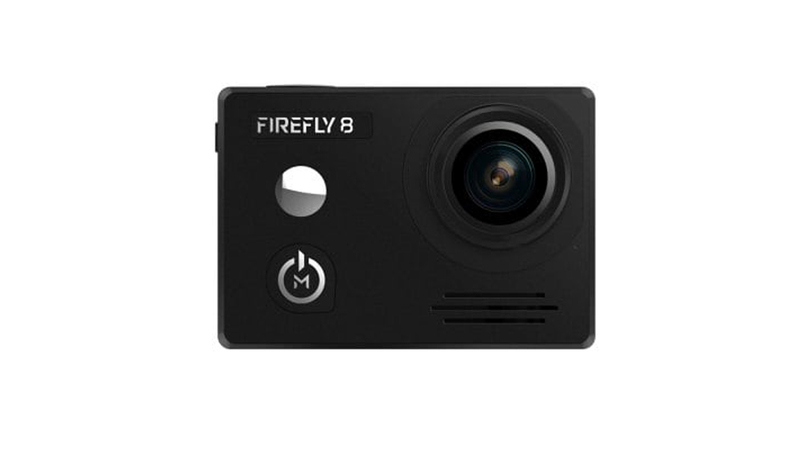 The Firefly 6S will turn off 30 seconds after the USB power supply is cut, which is convenient for usage as dashboard camera or with drones. You can select Large or Medium. A smaller angle will reduce image distortion but will also reduce image quality. I guess that a smaller part of the sensor is used and the picture is upscaled to full resolution. Here you can format your microSD card. to reset all your settings made. You can choose 50Hz or 60Hz to select light frequency and avoid flickering. 60Hz is used in the US, 50 Hz in Europe. If turned on it will reduce the fisheye effect. As there is an option to adjust the angle I think the image will be distorted with software. Here you can turn on and off the built in gyro for image stabilization. Your current system version is displayed. The official app is called “FIREFLY” and is available for iOS and Android. One thing which is disturbing when using the wifi, as soon as you leave the menu option wifi, it turns off. So you can’t change settings on your camera and live view the result on your phone, you always have to go back to the wifi option in the menu to turn it on again. You can select between photo and video mode. The only indicator which mode is selected is the record/trigger button in the middle, which changes from a camera (photo mode) to a record button (video mode). The next button is the camera roll which gets you to your videos and photos and the last one is for camera settings. In the camera roll you just see the file name, when you select it you can see a preview but you can also download the picture which is saved into your phone’s camera roll. When you select settings in the camera roll, you can choose fast download (for a compressed video/photo) or original file. I still have to find out what it does as HDR is not available in the camera’s menu. I think the resolutions are lower as most phones can’t display 4K nor higher frame rates. here you can select photo resolution with the same settings available as in the menu. to delete photos and videos which you selected for previewing. which deletes the photos and videos stored on the camera’s microSD card. At first I had some doubts about the 1600 mAh battery, but it really holds up the expectation. It lasted longer than the GoPro and I’m very satisfied with the battery life of this camera. There are a lot of options available in the menu to define the image the way you want. Image stabilisation works really well, I’m very impressed by the results. And the menu is easy to navigate – two buttons to move around and the record button to select. Only disadvantage is the wifi option as you have to stay in this menu selection to keep the connection. Overall it is a great and reliable camera for a great price.